Fits most 520 and 530, standard, O-ring, and X-ring chains. Compact design is perfect for the toolbox or fanny pack. couldn't get the master link on without it is I got this out and it worked immediately. worked well. Only bummer is you can’t use this while the chain is on the sprocket. Why didn’t I buy one years ago. For the price I can’t believe I just bought one of these. A heck of a lot easier than using needle nose pliers and flathead screwdriver. Picked up one of these and must admit it hasn’t seen the rigorous use I expect to give it but for the 1 time use it worked a treat! Whatcha see is whatcha get! Must have tool to do it right. Pusher bolt is a little soft but can easily be replaced. Works easier than vise grips. 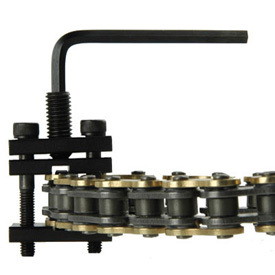 This is a nice tool to work on clip type o-ring style chains. makes it easy to press the link on to install master clip. It helps to have good eyes or use a magnifier or phone app to press just enough to get clip in the little grooves. Don't press too much or it might damage o-rings. You could travel with this one. Worked on my KLR650 as I was installing a new chain and both sprockets. Using the chain press made the installation of the snap clip sooo easy. Makes install of clip easy when you’re tired of working on your bike and just want to get the job over and ride. Great tool for pulling master pin. Very easy to use and great price. Tool works as it should. Makes the process of putting on the chain easier. Great price. This is a great tool. Makes compressing the master chain link a walk in the park! Pick one up. You'll be glad you did. Should have bought one of these along time ago. It made getting the master link on easy. The Tusk Chain Press Tool works perfectly. Makes installing the chain master link easy! Great website allowed me to find the correct parts that match my bike. Great product information and videos that not only help me decide what part to get but also the why and how to install it myself. The tool worked as I thought it would and feels like it is quality-made. Worked perfect for my 520 ORH X-Ring chain. I was also pleasantly surprised at how fast the items I ordered arrived at my doorstep. That allowed me to be a couple days ahead of my schedule. Love this product. It makes my chain install so much easier! No more fighting with pliers to complete your chain install. Pick one up!! I had been looking at those $100+ kits for changing chains but decided to give the tusk breaker and press a try. Both worked easily and effectively. Can’t complain. Only used once so far so we’ll see how it holds up. This is a must have for putting master link together. Cheap and does what it needs to. bought it for cheap to have around, worked nice for when i replaced my chain. Very cheap metal plates but do the job. All these years doing it the old fashion way. Got one of these babies and chain job took 5 minutes. Get you one NOW! A task done that is safe & reliable. Did exactly what I needed it to do. No more fuss getting plates evenly onto the links. Turns the job into a 1 minute task with a safe and reliable outcome. Well priced and works well, worth every penny. Once that costs 4 x might take a few minutes less to use but for the money it's the way to go. Once you get it into proper position, it works good. Makes the process sooo much easier, Amzing product! easy to use and really help out with chain. like part and overall great. works great, easy to use. makes installing O ring master links so much easier. Bought the tool to install my new chain. Worked well. Simple and effective. Cost to Performance is a plus. Not at the top end but is a solid performer and get the job done. This tool makes assembling your o-ring or x-ring chain an absolute breeze. Just line it up, tighten it down, install your master link clip and boom you're done! For 5 bucks it's worth doing things the easy way. Works as intended, great value. Wish I would've had this long ago. My next purchase will probably be the masterlink pliers since I found myself struggling with that the other day. 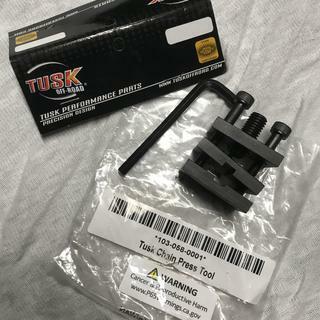 Tusk tools like this one seen to work fine. I carry this in my trail kit, used it to help out several riders we've met with chain issues. It makes putting on a 520 O ring master link easy! Easy as pie. Gets the job done much better than monkey wrench. Great for helping put masterlinks on. Comes with Allen wrench. 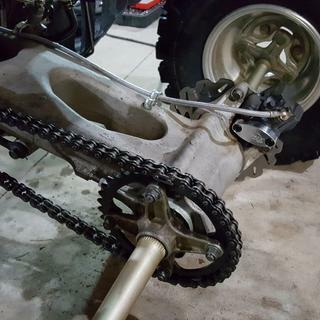 I just put a new chain on YFZ450R and this chain press certainly made easy work of compressing the masterlink. Awesome product and highly recommend. BEST ANSWER: All steel, works on both my Street bike Honda CBR600f3 and my wr450f, my kit came with no instructions, Nice plastic box, For when putting away you can easily see if all parts of the tools are back and ready for next use, Tool is easy figure out.works like a charm! Hope this helps. The tool is made of steel and works great for what it is. BEST ANSWER: I haven't used a 420 chain in a few years but I believe it will work. Will this work on a 428 x ring chain? BEST ANSWER: Sure! Works on all my chains. Saves damage, and reduces frustration. Can this push a link back into the chain If you cut your new chain too short?